We apply the advanced micro-processing network control technology for GRP20 passenger lift. High performance CPU and large capacity storage space, CAN-BUS serial communication produce the extremely strong anti-interference capabilities and perfect lift operation functions. The users can increase special functions according to the specific needs. At present, the modular; intelligent and extensive system, multi-functional serial interface, long-distance monitor technology etc. 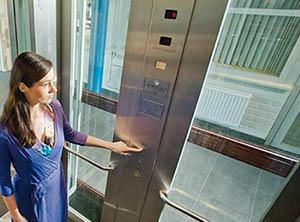 belong to the advanced control technology in the lift industry. The concise and reliable serial communication network is adopted between various control sub-systems in order to fulfill a series of the functions such as calling, command, group supervision signal, floor display etc. It greatly reduces the trouble possibilities out of circuit problem, largely enhances the reliability of the lift travel. At the same time, it brings more convenient repair and maintenance to the lift system. SRH GRP20 passenger lift special invertor takes the control theory of the advanced technology as the foundation. The start, acceleration, brake curves are designed according to the ergonomic theory in order to get the finest coziness. It is a genuine current vector control variable frequency drive system. SRH Lift applies the advanced VVVF variable voltage and variable frequency control technology to the lift door operator system so as to ensure the smooth lift door and quiet switch. What is more, the self-learning door load detector increases the sensitivity of the lift door switching on/off. It monitors the variation of lift door load on every floor. Automatically rectifying the most appropriate open / shut speed in every floor so as to guarantee the security and reliability. You can click www.fujihd.net to see more different products.